Platinum stylish necklace set having rubies aligned at every element of the product adds beauty to the entire neck set. 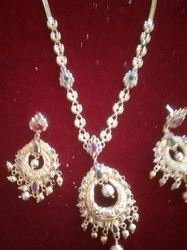 Silk thread jewellery set with flower charms. Available many designs.color and sizes can be customized. We have carved a niche amongst the most dominant names in this domain, involved in providing superior quality range of Long Zircon Necklace.